Lou Rena Hammond has transformed a three-employee, three-client company into an award-winning, independent public relations and integrated marketing agency with 40 employees and more than 40 prestigious travel, retail, lifestyle, technology and real estate clients with offices in New York, Charleston, Miami, Houston and Los Angeles. Over the past 34 years, she has led Lou Hammond Group in its service to clients through media outreach and integrated programs; public relations, public affairs, digital marketing, creative services, branding, content creation, international promotions and crisis communications. 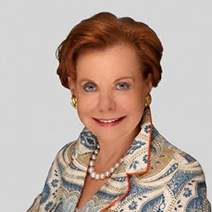 Lou developed her specialty in marketing to sophisticated, upscale consumers during her 15 year tenure at Pan American World Airways where she served as director of publicity and public affairs and acted as the carrier’s lobbyist for the state and city of New York. The agency has earned numerous accolades; Creativity in Public Relations Award from Inside PR, a three-time winner of the Big Apple Award and a record-breaking 100+ Adrian Awards. Lou was honored by the Women in Communications’ Matrix Award, HSMAI’s Winthrop W. Grice Award and named to the PR News’ Hall of Fame. Lou sits on the boards of Spoleto Festival USA, Medical University of South Carolina Foundation, Gibbes Museum of Art and the American Red Cross of the Lowcountry. She is cited in Who’s Who in America for the past 20 years. A fifth-generation Texan, Lou resides in New York and Charleston.